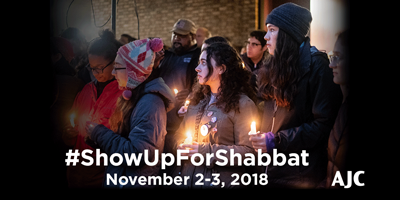 Join AJC in honoring the memory of the Pittsburgh synagogue shooting victims and standing up to anti-Semitism and all forms of hate by participating in the nationwide #ShowUpForShabbat campaign. AJC is calling on Jewish communities across the country—along with elected officials, religious and civic leaders, and other allies, both Jewish and non-Jewish—to flock to synagogues this coming Shabbat (Friday night and Saturday, November 2-3). For those who want to #ShowUpForShabbat but do not belong to a Synagogue, please reach out to a member of the Synagogue or the Synagogue staff in order to assure that the Synagogue is able to accommodate your desire to attend. By adding your name and information, you are sending a clear message that when hate raises its ugly head anywhere in our country, we will rise to confront it with solidarity and determination.